Bette’s Oceanview Diner is one of my favorite places in Berkeley, California. They have a cute, bustling diner feel – rare to find on this coast – and fantastic food. Their basic pancakes and scones are really excellent and their specials are equally delicious. It’s hard to pick a favorite, but the enormous Dutch Bunny – a 12 inch puffed apple pancake – is definitely a consistent favorite. Even if you need 4 people to eat one. It also opens quite early, which would have swayed my opinion of it even it I didn’t love the food because I’m a morning person and it sometimes seemed like things in Berkeley didn’t open for breakfast until after 10am. Getting up early also prevented me from having to wait in a long line just to get in the door. When I was flipping through the Bette’s Diner Pancake Handbook , I decided that based on their excellent recipe track record, their recipe for sourdough english muffins would be a good place to start to make an attempt at a non-pancake breakfast favorite I’ve wanted to try for some time.I was surprised at how easy these were. Once my starter was fed, I mixed up the dough and let it sit, covered, overnight. You donâ€™t have to worry about overdeveloping the sourdough flavor because the baking soda will neutralize some of it, leaving just the right amount of sourness in your muffins. The major change that I made in this recipe, aside from using some whole wheat flour, was to replace the milk the original called for with water. I wanted to ensure that I got the rather coarse, open texture I like in english muffins. I could only find a small biscuit cutter, so I had to use 2-inch rather than a 3-inch round. If you use a larger one, you may need to cook yours for an extra minute or two per side and you will probably get fewer than the 20 or so that I got. They tasted fantastic. They were a bit doughy when hot off the grill, but like most yeast breads, their texture stabilized once they were allowed to cool for a few minutes (they cooled quickly). 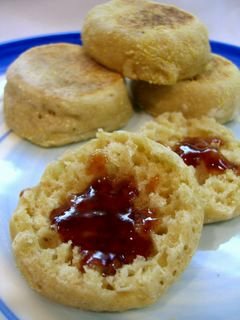 Honestly, they were some of the most flavorful english muffins I’ve ever had – chewy, slightly sour and full of holes to catch jam and butter. In the morning, add the baking soda, salt, sugar to the dough and gradually add the remaining 1 cup of flour, 2 tablespoons at a time, until the dough looses its stickyness. Turn dough out onto a lightly floured surface and roll until about Â½ inch thick. Use a lightly floured biscuit cutter and cut the dough into as many rounds as possible. Place rounds on an ungreased baking sheet, covered with cornmeal. Sprinkle the tops of the muffins with cornmeal and leave them to rise, covered with a clean dishtowel, for about 45 minutes. Those look great. I love anything sourdough. Those look wonderful, Nic. I can see that I need to get past my hesitation about sourdough starters (they just seem so high maintenance to me). Oh cool !!! Bette’s is just right over THERE. Neat. You’re right, it is that good. We go to the To Go next door for lunch time sammiches and Choco Puddin’, yum. Boy it’s cold up here this week, brrrr. Brady – There is a link to how to make a starter in the post, but you can also find it at this link. Wow! I really need to try these, they look BEAUTIFUL! I love english muffins. Thanks for the recipe and inspiration. Your muffins look yummy and fantastic. I had made sourdough bread, but I have failed several times. So this time I’ll make sour dough starter in your way. I really need to get a starter going – I’ve always wanted to make these. Great job! I used to make sourdough bread all the time and just recently learned to make English muffins… will have to give these a try, looks yummy! I need to have you make these for me, Nic – looks great abd perfect! I have been searching the web for a GOOD English muffin recipe…with holes! Yours look delicious. However, I don’t particularly like sourdough. Do you have a recipe for regular English muffins? The chewy, holey kind. have you tried this recipe with whole wheat flour? also, most other recipes i’ve seen have used milk…does using the sourdough starter give it the same characteristics that the milk does? Unfortunately, I have to close comments on this post due to a tremendous volume of spam (deleted, of course!). Check the contact page to e-mail with questions, if you have any.